In the year 1900, author Frank Baum wrote “The Wonderful Wizard of Oz,” which many believe is an analogy to our monetary system. It shouldn’t surprise you if you think about some of the elements: silver shoes and a yellow brick road (gold) leading to Oz (short for ounce, which is how gold is priced), where an all powerful leader (the President) rules in a land of illusion (ring a bell?). There’s the Wicked Witch of the East (Wall St.) and on and on. You can read about the background here, but make sure you read through the section entitled “Allusions to 19th-century America,” about half-way down the page. In the 1890s, politicians were still hotly debating who should create the nation’s money and what it should consist of. Should it be created by the government, with full accountability to the people? Or should it be created by private banks behind closed doors, for the banks’ own private ends? For centuries, there’s been this ongoing discussion about how a country’s monetary system should operate. We know better than to adopt the current one, but we continually get duped by “banksters” and end up with a system that eventually divides the rich from the poor and allows a very small segment of society to take advantage of all the rest. This happens over and over again throughout history. This time, though, is the all-time “topper.” It’s going to take a long time to recover from the devastation that banksters and their enabling political partners have wreaked upon us—a long time indeed. However, these private banks create money just as a nation’s public bank would—out of thin air. They actually create debt—a simple entry on a spreadsheet (or more likely today, the press of a computer key). The cost to these sovereign nations is almost unspeakable. They are now all beholden to the Bank of International Settlements (in the case of the US, the Federal Reserve) as they all now own these private banks more money than they can ever pay back. In 1694, the Bank of England (in its original charter) created the model for today’s private banking “money tree.” A circular in its stock offering stated, “The Bank hath benefit of interest on all money which it, the Bank, creates out of nothing.” This was interest charged to the government. Naturally, England’s national debt skyrocketed from $1.2 million pounds to 16 million pounds within just the next four years, due primarily to compound interest. This is the same model that the Federal Reserve operates on today. They key in these contracts is that the principal is never paid back; the interest ends up being a constant stream back to the bank, paid for by taxpayers. What you see happening now, particularly with Greece, is that this banking cartel is now acquiring sovereign assets. Greece is being forced to sell what it can to pay off this many tentacled financial octopus. This is the ultimate plan of the banking elite. Here’s a summary of amounts owed by the G7 countries as of September, 2016 (data from the world debt clock). 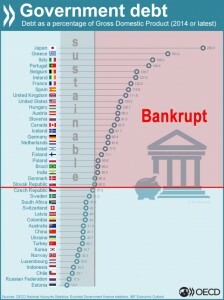 On the left is a clickable chart showing the countries in the world that are considered bankrupt. Owing over 60% of GDP puts you in the bankruptcy category. Currency was invented as a medium of exchange—that’s its purpose. Because without it, you can have no commerce; you are forced into a barter system. In a barter system, how do you buy a car? You would have to come up with some other asset of equal worth, or a basket of assets of lessor value adding up to the price of the house. Currency should also belong to the people; it’s how a society creates markets and raises its standard of living. It’s only when governments and private banks become involved that the currency system gets destroyed. Throughout history, we’ve seen a similar cycle play out again and again. But let’s look at a couple of recent examples so that we can understand what the ultimate, most fair system would be. We’ll start in the United States, well before confederation, in the year 1691. Massachusetts decided to create its own paper money, because the colonists were short of silver and gold. They had to use foreign coins to conduct trade, and since they imported more than they exported, the coins were continually being trained off to England and other countries, leaving colonists without enough money for their own internal needs. The new printed currency proved so successful that other colonies eventually followed suit. Paper money did more than make the colonies independent of the British bankers and their gold. It actually allowed the colonists to finance their local governments without taxing the people. The currency was secured not by gold or silver, but by the full faith and credit of the country as a whole. How it worked was that a government loan office would issue paper money and lend it to residents (usually farmers) at low rates of interest. New money issued to borrowers came back to the loan office on a regular payment schedule, preventing the money supply from over inflating. The interest that was paid on the loans went into the public coffers, funding the government. In that way there was no need to tax the people, because the government received all the money it needed to function from the interest on the loans. One of the most successful loan offices was in Pennsylvania. The Pennsylvania plan showed that it was quite possible for the government to issue new money in place of taxes without inflating prices. President Abraham Lincoln lost his life in the pursuit of a fair and equitable monetary system. He had the government issue money during the civil war, but when he was assassinated, the bankers once again reclaimed control. William Jennings Bryan was the Populist candidate for President in 1896 and again in 1900. 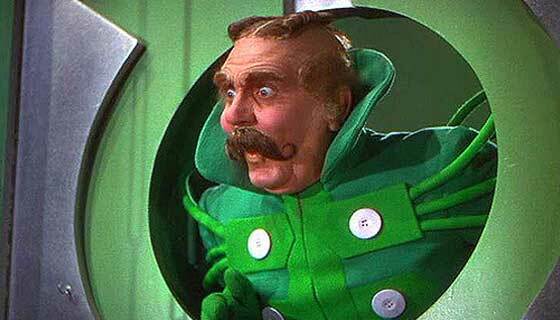 He was represented by the cowardly lion in The Wonderful Wizard of Oz. His challenge was to the Morgan/Rockefeller banking cartel (The Wicked Witch of the East), which was bent on taking away the power of creating money from the people and the government. It all culminated in the passage of the Federal Reserve act in 1913, something they achieved by misleading Bryan and other unwary Congressmen into thinking the Federal Reserve was actual “federal”—part of the government, rather than a group of twelve private banks. What’s resulted is a system in which the Federal Reserve, like the European cartel of private banks that lends to Canada, creates money out of thin air and loans it to the United States government at interest. This obviously is a function that the government can take on itself (creating money out of thin air). All it has to do is create a public bank. In the case of the United States, this would require a change in the constitution. In Canada’s case, we just have to decide to do it. What inflation does is devalue our money. 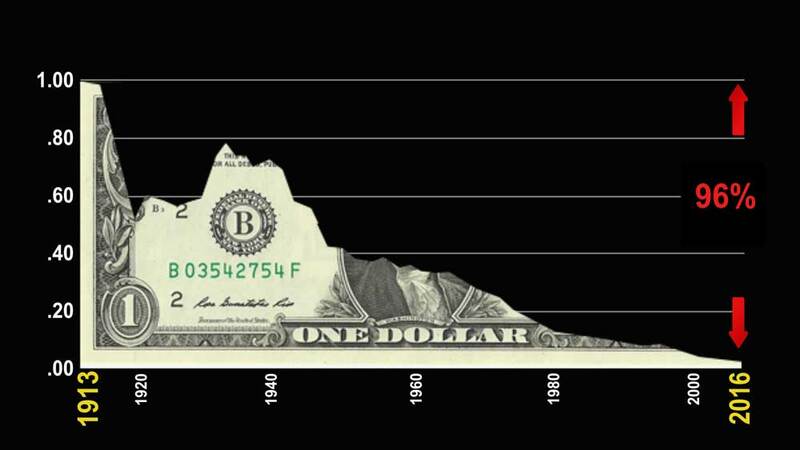 For example, since 1913, the dollar has lost 96% of its value. So, in fact, a 1913 one dollar bill is worth four cents today. That’s why everything seems to continually get more expensive. Our money is relatively worthless. It takes more dollars every year to buy that new car, for example. Car prices continue to increase, but it’s actually our money that’s becoming worth less. Likewise, as inflation eats away at the value of the dollar, prices for products and services rise. However, our salaries don’t rise nearly as much (if at all). Our standard of living decreases, as a result. 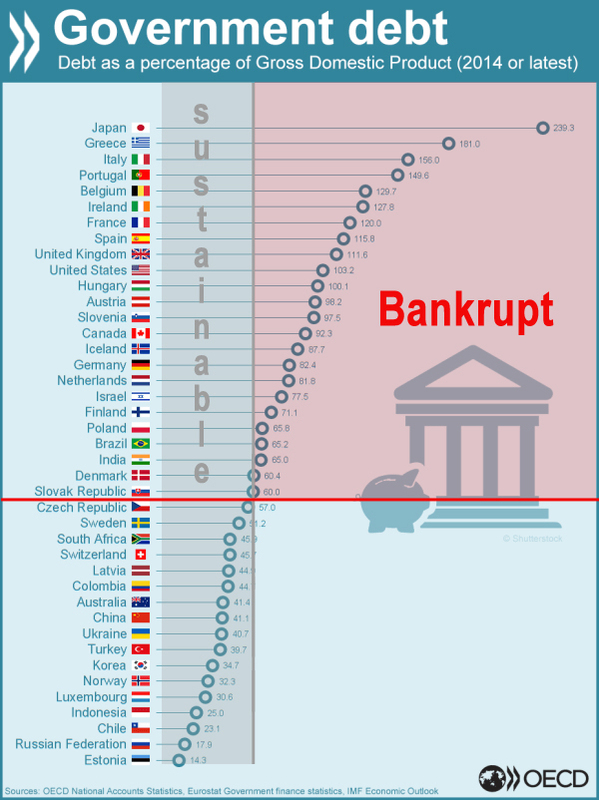 When we attempt to keep the same standard of living, we sink into debt. Business gets hit in a similar fashion. Costs for raw materials continue to rise. But if companies raise prices too much, they lose business. So they work on finding less expensive ways to make the same items, or cut back on quality. While prices go up and quality goes down, your salary virtually stays the same. So you end up going further and further into debt to maintain your lifestyle. The bottom line is that inflation destroys our economy. It makes us poorer. So why do governments create inflation? Because they get hooked on it. The cause is external debt—the debt created by central private banks. Because inflation causes the value of currency to decrease, governments find it much easier to repay debt. They repay it in tomorrow’s inflated dollars, which are actually worth less. Plus, when prices go up, the GDP goes up. That’s Gross Domestic Product. That’s like the government’s salary and assets—their net worth. A higher GDP allows them to borrow more money and go further into debt. It’s a revolving, deepening cycle, which eventually meets a very bad end. The underlying problem comes back to private banks and compounding interest. If a country’s banking system was a public banking system, there would be no interest, as it would revert back to the government, and would pay a large portion of government expenses. As a result, taxes would be lower. The government would only have to inflate as the population grows, or industry expands, and we wouldn’t have these incessant bubbles and crashes. Many believe that the answer to all our currency problems is to dismantle the current fiat system and lock the dollar to gold. This, they say, would stop runaway inflation. But inflating (creating money), is needed in moderation as the economy expands. If the dollar is tied to gold at a regulated rate, inflating is impossible. There is only so much gold available and so the economy can neither expand or contract. If the need to currency expands, the economy becomes stifled and moves into recession. People horde gold and there is less of it available in circulation. This was why Nixon uncoupled gold from the US dollar in 1971. The issue is debt owed to private banks, along with compounding interest, which exacerbates the problem. Until we free ourselves from the international banksters, we’ll revisit poverty each time these cycles peak. We’ll experience another revolution as our ancestors have so many times before. In 1994 (most recent version), the Federal Reserve Bank of Chicago published “Modern Money Mechanics,” an explanation of how money is created and injected into the financial system. It’s a damning exposé of the fiat money system and how banks gradually bleed the economy to death through compounded interest. You can download the PDF here. Here we are at the top of a man-made bubble—the largest one in history. But what’s really interesting is that these man-made bubbles run in parallel with natural cycles. The climate is changing from hot to cold. At the same time, social mood is turning negative. People around the world are angry. We see mass migrations, authoritarianism, weak leaders, society breaking down, and on an on. These are the same themes that are prominent every 172 years, and to a larger extent, every 500 years.